Last year I received a Jamie's 30 Minute Meals cookbook from my daughter. My plan was to attempt to cook the entire whole meal from the book. I am not taking the 30 minute challenge but to go slow and take my time to enjoy the cooking process. This Chicken Pie recipe is part of the meal taken from the book. In the book, the Chicken Pie is served with French Style Peas, Sweet Carrot Smash and Berries, Shortbread and Chantilly Cream. The pie was shared by 3 and all of us enjoyed it very much. We like the hearty, smooth and crusty pie and it is really a comforting dish to eat. Put the chicken breasts on a plastic board and slice into 1cm strips. Put a lug of olive oil and knob of butter into the hot, large, wide pan. Add the chicken and cook for 3 minutes or so. Add to the pan with 1 heaped tablespoon of flour and stir. Add 2 teaspoons of mustard, 1 heaped tablespoon of creme fraiche and 300ml of chicken stock and stir well. Lightly dust a clean surface with flour and unroll the sheet of puff pastry. Use a small to lightly criss cross and score it. Take the pan of chicken off the heat. Tip the filling into an ovenproof baking dish slightly smaller than the sheet of pastry (30 x 25cm). Cover the filling with the pastry sheet, tucking it in at the edges. Quickly beat the egg, then brush it over the top of the pie. Put into the oven and cook on the top shelf for around 15 minutes, or until golden and gorgeous. Note: This Chicken Pie was done in about 25 minutes. A very fast and delicious meal! I will definitely cook this again, with the suggested sides and dessert to complete the meal. 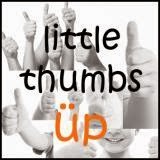 This post is linked to Little Thumbs Up 'Chicken' hosted by Diana of The Domestic Goddess Wannabe, organised by Doreen of My little favourite DIY and Zoe of Bake for Happy Kids. Oh yummy! My kind of dinner ^-^! Hi Lian I have book marked this. I think it is such a fun thing to do to try to cook the recipes in a single book!